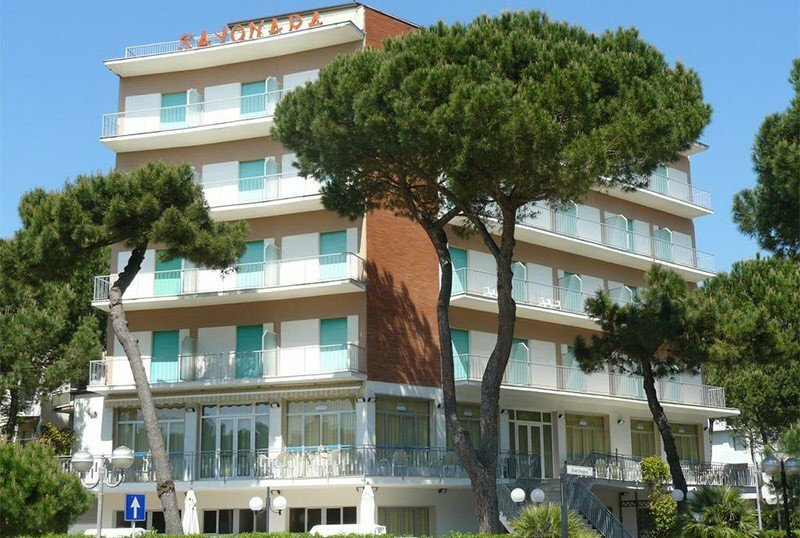 The Hotel Sayonara is a 3-star family-run hotel of Milano Marittima located near the sea. It has free parking lots, garden, WI-FI and services for children.Pets allowed upon request. The hotel is located in Milano Marittima, overlooking the avenue "Anello del Pino" in a green and quiet area, a couple of minutes walk from the beach.There are bus stops situated in front of the hotel. The buses goes either to the city center and to Mirabilandia amusement park. The rooms are spacious and equipped with LCD TV, WI-FI, air conditioning, telephone, safe, bathroom with hairdryer and complimentary toiletries, curtain or shower cubicle, mini fridge upon request. All rooms, except the single ones, have a balcony. FAMILIES: available rooms for families composed of two connecting rooms. Garden, open-air porch, terrace, bicycles with children seat, reading room, lift, theme nights. PARKING: outdoor parking with covered spaces, available upon request. WI-FI: free, available throughout the entire building. PETS: allowed pets of all sizes upon request.Pets are also allowed on the affiliated bathing establishments. BREAKFAST: sweet and savory buffet, with homemade desserts. LUNCH AND DINNER: local cuisine with 4 main courses and 4 second courses with fresh fish; pasta and desserts are homemade. VARIATIONS: vegan menù available upon request, as well as vegetarian and gluten-free meals. In hotel: indoor and outdoor play area, strollers on request, pediatrician on request. In the room: cots, safety rails, baby baths, bottle warmers on request, night lights. At meals: baby menu agreed with parents, baby food, homogenized. On the beach: playground, baby / mini club, animation. The hotel has an agreement with the Acquamarina Village bathing establishment, it offers bar, restaurant, mini club, play area, nursery, whirlpools, gym, playgrounds, entertainment and an equipped area for dogs. Prices are per person per day in a standard double room. Discounts for the 4th bed are to be agreed privately. For this 2019 we are pleased to see the doors of the Hotel Sayonara to our kind guests during the Easter period. the Easter evening will be enlivened by musical entertainment, and after dinner dances and dances.